The Olympic Games are what dreams are made of and Manuel Osborne-Paradis can create his own chapter of real-life fantasy by winning gold on the slopes of Whistler Mountain where he first began skiing at the age of three and where he will be cheered on by family, friends and thousands of Canadian fans. The fun-loving easy going Vancouverite known as "Manny" readily admits it is his love of speed that first drew him to skiing when he used to tear down the pistes of Whistler with his grandfather. His goal of becoming the fastest downhiller in the world is not far from reality and his progress had been steady since first making the Canadian team in 2004 at the age of 20. 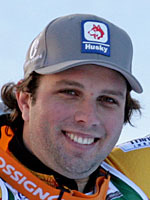 Osborne-Paradis won silver in the super-G at the 2004 world junior championships and made his World Cup debut one year later. His results were solid without being spectacular but in the highly competitive world of professional skiing the Canadian would need time to finally get onto the podium. Lake Louise appears to be one of his luckier mountains and in November 2006 in front of his weeping step father, he took second in the downhill behind Liechtenstein's Marco Buchel for that elusive first top three finish. He then finished a respectable 13th in the Olympic downhill at Turin in 2006 and picked up his first top ten finish at a major competition in 2007 at the world championships in Are, Sweden where he took ninth. The 2008-09 campaign saw Osborne-Paradis notch up a series of top ten finishes as his confidence grew with the hopes of that first World Cup victory. He specialises in the speed events notably the downhill and super-G and finally on March 6, 2009 he landed his first victory in the downhill wearing bib number 13 at Kvitfjell, Norway which preceded a third place result the next day also in the downhill. The next season his Olympic preparations for Vancouver really began to take shape with his his first World Cup win in the super-G at Lake Louise in November and then his second downhill victory at Val Gardena just before Christmas. He is known for his love of life and ability to make friends easily while he is also a fan of surfing, golf and mountain biking. Osborne-Paradis has also set up ski camps for young and talented skiers and in April 2008 along with teammate Mike Janyk the two men set up the "Cowboys Camp" to further develop his work with youngsters.